I am a product of the ’80s. I also grew up along the water in the Puget Sound area of Washington state. And during that time there were two words that caused worry and fear in children and adults alike. Red Tide. My family, excluding myself, loved eating clams and mussels. I just enjoyed harvesting them, and remember fondly the trips to the ocean to dig for razor clams or walking the shores of the Puget Sound and islands gathering mussels. It was an adventure. And a source of free food. You can’t ever underestimate the free food factor. So while we liked these harvesting adventures, we had to be aware of the dreaded red tide. The state’s Department of Fish and Wildlife would have bulletins and flyers on the beaches and in sporting goods stores. Local newspapers – remember those? – would have articles and catchy headlines to bring attention to the frightful red tide. To an outsider that didn’t grow up in that area in the early 80’s, this may all sound like fear mongering and hyperbole, but it was grounded in something real, and we weren’t yet desensitized by 24/7 news and social media. September of 1978 market the first recorded outbreak of illness due to red tide in the inner Puget Sound waters, sickening nine people who feasted upon shellfish, sending four of them to the hospital (1). This outbreak occurred on Whidbey Island along the Saratoga Passage, an area I could clearly see from my hometown, and maybe my house if I was standing on the roof. So this struck close to home. The red tide then marched south like General Sherman, leaving closed beaches and mussel-less families in its wake. So if you’ve made it this far I guess I’m honor bound to let you know what causes Red Tide and poisoning from it. 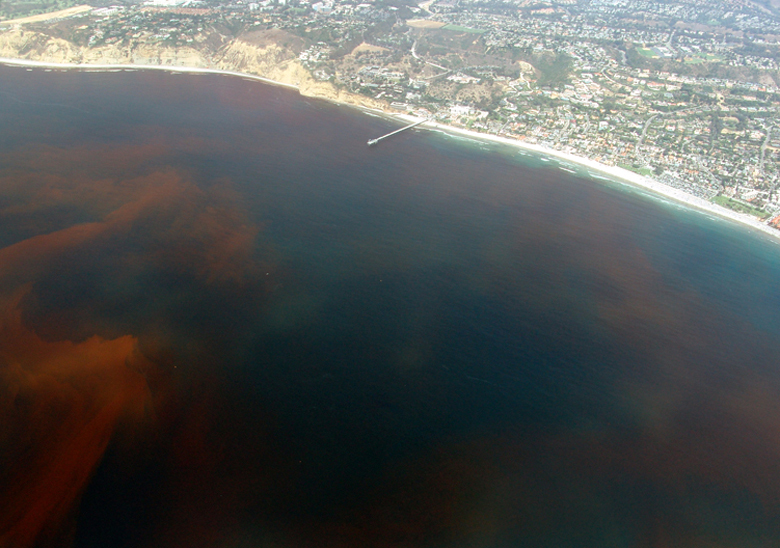 Red tide is a catch-all term that refers to an algal bloom, creating red or rust colored waters. In the Puget Sound, the bloom is primarily due to dinoflagellates of the genus Alexandrium, a marine plankton. The blooms occur when the nutrients, temperature, and light are optimum. But the term red tide is a bit misleading. First, you can’t really see that the water is red, it’s just not that obvious when you are at sea level. And second, not all harmful waters appear red, and not all red waters are harmful. So the phrase red tide is being phased out. Though it is such a part of the Pacific Northwest lexicon, I doubt it will ever be replaced. So we’ve narrowed red tide down to Alexandrium dinoflagellates, but how does this poison us? Bivalves, like mussels and clams, feed by taking in water and filtering the plankton with their gills. Mussels, attached to a rock or pier, simply open their shells to take in water. Clams, laying beneath the sand and rock, have “necks” that extend into the overlaying water that pump in water. Either way, the bivalves live in inter-tidal areas where the algae blooms thrive, and take up and store a large amount of Alexandrium and the poison it produces, saxitoxin. Saxitoxin is one of several neurotoxins that are responsible for paralytic shellfish poisoning (PSP). The first recorded instance of PSP comes from the records of Captain George Vancouver, who explored the Pacific Northwest for the British Navy (1). He gave the names to Mt. Rainier, Mt. Baker, and Mt. St. Helens. And if you guessed that Vancouver Island and the city of Vancouver were named after him, you’d be right. During a Canadian expedition in 1793, four of his crew collected and ate mussels for breakfast (ewww). All four immediately felt a tingling and numbness in their lips, followed by paralysis of the arms, and for one sailor, death. The name given to the spot where the mussels were eaten? Poison Cove, of course. Since that ill-fated day, tens of thousands have experienced PSP and hundreds have died at the hands of saxitoxin. Saxitoxin acts as a sodium-channel blocker by binding to the outer pore loops, preventing sodium ions from passing through the membrane (2). This action prevents the formation of action potentials in nerves and muscle fibers, leading to paralysis. The paralysis is frightening, as the victim is completely concious, right up to the point of death due to cardiac arrest. 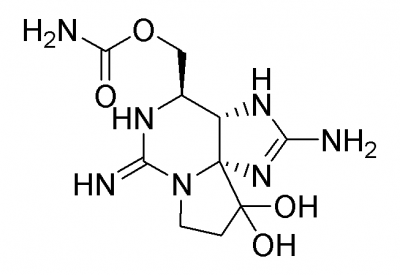 Saxitoxin is one of the most deadly marine based toxins known, and falls behind botulism toxin, abrin, and ricin overall (3). With a lethal dose estimated to be 350 micrograms of saxitoxin for an adult, and some clams containing greater than 400 micrograms of saxitoxin, death from one lowly clam is possible (4). Saxitoxin is not destroyed by cooking, and can exist in clams and mussels for months, even after a red tide outbreak. And once poisoned, there is no antidote, just supportive care. The exact role of saxitoxin in dinoflagellates is unknown. It does not seem to deter bivalves from consuming them, as most seem to be insensitive to saxitoxin, and besides, how are you going to stop them from drinking the water they live in? It could be that these single celled organisms just hate us and don’t want us to be happy. Red tide blooms have been more frequent and more intense since the 1980’s, and it is hard to imagine that humans have not influenced this in some way. One hypothesis is that an increase in nutrients polluting the waters from farming and industry is feeding the blooms. Regardless, it is important to know that the old wives tales about red tides only occuring in months that don’t have an “r” in them, May-August, is absolutely false. Pay attention to local bulletins, and when in doubt, call the local fish and wildlife department. Or better yet, just abstain from the chewy things. 1. Strickland, Richard M. The Fertile Fjord: Plankton in Puget Sound. Seattle: Washington Sea Grant, 1983. 2. Aráoz, Rómulo, Molgó, Jordi and De Marsac, Nicole. “Neurotoxic Cyanobacterial Toxins.” Toxicon 56.5 (2010): 813-828. 3. Bigalke, Hans and Rummel, Andreas . “Medical aspects of toxin weapons.” Toxicology214 (2005): 210-220. 4. Kvitek, RG, and Beitler, MK. “Relative insensitivity of butter clam neurons to saxitoxin; a pre-adaptation for sequestering paralytic shellfish poisoning toxins as a chemical defense.”Marine Ecology Progress Series 69 (1991): 47-54. Tags: dinoflagellate, red tide, saxitoxin, toxin. Bookmark the permalink.